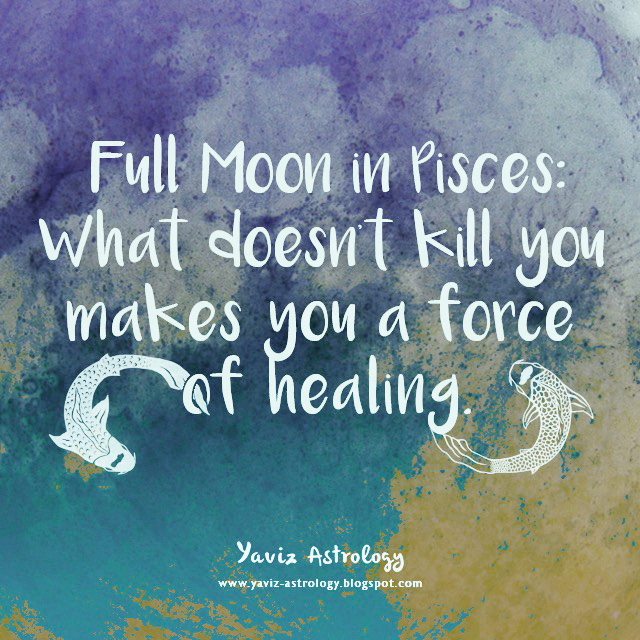 Full Moon in Pisces: What doesn't kill you makes you a force of healing. What does it mean to heal? And what does it mean to be healed? How can we heal another? And how can we find healing in another? The answers lie in our wounds. What is painful to us may not be painful to another. And what is painful to another may not be painful to us. Know that a painful experience may leave us with some emotional wounds, but those wounds can be healed once we are ready to get to their roots and try to understand the deeper, underlying issues. Why are we hurt? Why is heartbreak so painful? Why does betrayal feel so terrible? Many of us feel that the only way we can be healed emotionally is if we see a change in the other person. When in truth, the reason why we feel hurt is because we have given our power away. So what kind of power do we have that we've given away? It is the power to respect our humanity. The power to honour our soul. The power to stand tall. And the power to stay true to our own heart. We always have this power within us, and we always have the capacity to embody our most authentic truth. Yes, it's okay to feel the pain. And it's okay to feel the anger. But once we reach that dark part of the soul, that's where we can begin to see the light. The light that is always embedded within us, and waiting for us to acknowledge it. As we see that light, that's when our healing begins. Step by step, we grow stronger, wiser and more aware. And from there we light the way for others in our world to see that they too, can find their own inner healing light. Happy Full Sturgeon Moon! The Moon is joining Neptune Rx and Chiron Rx in Pisces opposing Jupiter and the Sun in Virgo, marking an especially dreamy, idealistic and intuitive Full Moon in the sign of the Fish. The name Sturgeon Moon comes from the fishing tribes that see this month as a time when the sturgeon - a large fish common to the Great Lakes, is most easily caught. The reddish appearance of the Moon through the sultry hazes of August also prompted some tribes to call it the Red Moon. The Moon in Pisces itself is emotional, instinctive and romantic. With the conjunction to Neptune Rx and Chiron Rx the Moon becomes extra imaginative and spiritual, as well as bringing the potential for emotional healing. Ruling the 12th House in Astrology, or the House of the Subconscious, Pisceans are known for their extremely sensitive, mysterious and elusive nature. They may try to escape the realities of pain and suffering by retreating into their own private worlds or indulging in some kind of addiction, but once they are aware of these tendencies, they can be some of the most compassionate, wise and hard-working people out there. Chiron's transit through Pisces has been helping us to go deeper into our subconscious to discover our unconscious patterns. What kind of beliefs do we harbour that have been holding us back from reaching our truest potential? We have the courage now to understand that healing is an ongoing process, and each day brings a new chance for our healing to unfold. The Moon's opposition to Jupiter and the Sun highlights our connection with the world at large. How do we feel about what's currently happening in the world? What can we do to make the world around us a more peaceful place to live in? Strong bonding could lead to firm and lasting friendships in the future. The atmosphere carries with it a powerful energy that influences our ability to aim high and to stay focused. Add fantasy to our dreams as we take that next step, and have faith that the stars have even more in store for us down the line. This brings a whole new meaning to the word love. We finally remember that we are the creator in our own world and that love can break barriers between our fears and our dreams. Since Full Moons are a time of culminations, this can be a great time for a new outlook on our current situations. If we feel like wandering off on our own, perhaps to explore or simply to relax, there could be someone willing to join us. Make the most of this Full Moon as we are more emotionally in touch with the vibes around us. Things we do differently could work out better than planned. Just make sure to be truly honest with ourself about what we want. Make a list of all the positive things and let go of the old and the toxic. We are, after all, in a cycle of completion. A time when we are releasing old unhealthful habits or going on a spiritual journey. With the Moon's sextile to Pluto Rx and the trine to Saturn, we trust our psychic senses to guide us on our way. Pluto helps reawaken our senses so as to open our eyes to see things as they really are. We don't take worries too seriously, as we know that they're only distractions conjured up by the ego. Fate could intervene to add just that slight touch of magick to transform our vision into reality. Stay in the shallow end at first, then gradually we can go deeper to explore. Listen to that inner voice, it has been trying to tell us something. If our responsibilities require us to be amongst harsh energy, then be sure to pray for shielding and protection. We can be a wonderful leader now for those who may be lost in the dark. We have found our own footing to be firm and steadfast, and experience can show in moves we make. Blessings in disguise await, especially if we're willing to be open to our prayers being manifested differently than we expect. Drop attachments to specific outcomes and trust the universe to deliver divinely perfect manifestations. We can soon see the big picture and why everything has to happen the way that it happens. This weekend, be especially focused upon keeping our energy clear of fear. As soon as we become aware of any distress in our consciousness, pray to be returned to our natural loving and peaceful state of being. Deep breath . . . exhale . . . and welcome the blessings that come from healing. 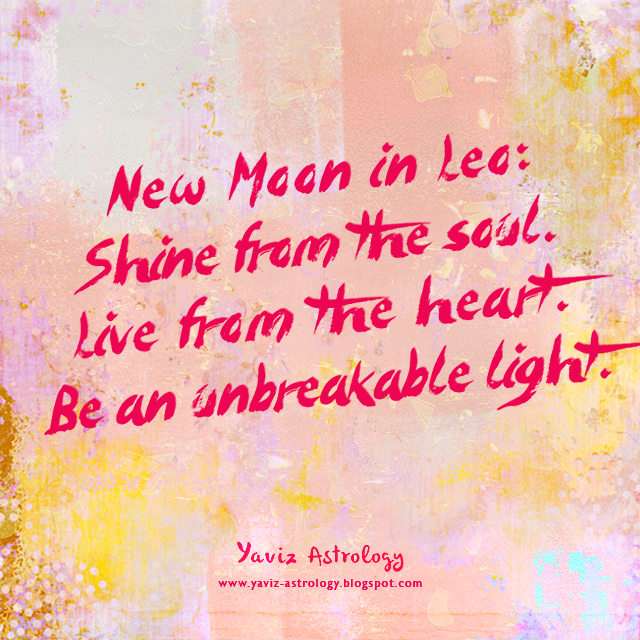 New Moon in Leo: Shine from the soul. Live from the heart. Be an unbreakable light. How many times have we heard people talk about the idea of shining their light? Apart from being true to who we truly are, what does it really mean to shine our light? How about those days when we don't feel whole enough to let our light shine? Perhaps we can start by finding out what it is that can bring back our inner light in times of darkness. And we can begin as simple as figuring out what we can do in the present moment that can make us feel happy and more hopeful again. Perhaps it's wearing our favourite piece of clothing, or perhaps it's making our favourite meal. Perhaps it's going out with our friends, or perhaps it's staying in with a good book. Know that whatever course of action we choose to take to cheer ourself up is a step closer to finding our inner light. Some people may choose to make a prayer, and some will choose to meditate. Some people may choose to listen to their favourite music, and some will choose to sing their heart out. Some people may choose to cry and let their emotions out in private, and some will prefer to get out in nature and scream their lungs out. The answers to our questions always reside within us. Our ability to find the inner light is in our hands, if we are willing to look deeper into our heart. And once we find that which can bring us into a state of hopefulness, we begin to shine a little brighter. Awakened hopefulness, not blind cynicism, is the beginning of a more open heart and mind. Never lose hope and we'll never lose our light. Happy New Moon! The Moon is joining Mars, the Sun and Venus Rx in Leo, marking an especially vibrant, loving and intuitive New Moon in the sign of the Lion. The Sun, being the ruler of Leo, feels most at home in the sign. With its conjunction to Venus Rx, this New Moon is a wonderful time to restart from the heart. No matter how many times our heart may have been broken, we have the power now to start again. To begin owning who we truly are because we understand our heart better. To realize that the good always outweighs the bad, because every relationship brings to us a new and more profound understanding about ourself and what our soul really wants. And to know that we have come out stronger, wiser, and more aware than we've ever been before. All these deep-rooted shifts have been happening because of the Venus retrograde. Venus, the planet of love, going backwards means we go within to understand love better. And since Venus is retrograding in Leo, a sign that rules the heart, we truly go deep into the inner realms of the heart. What makes us tick in love? What will we no longer put up with in relationships? What kind of compromise or agreement are we ready to make? As we listen more closely to what love is trying to tell us, we become more in touch with our heart, and therefore able to think, act, and speak more openly from the heart. The Moon is forming a quincunx to Neptune Rx and Pluto Rx, and we may feel a little torn between what we believe we can do and what we feel we ought to do. No words need to be said, our whole being says it all. Our mind can actually be active and sharp, as long as we don't give in to the confusion. Now would be a good time to think about our plans for the future. We have our dreams and ideals, so it helps if we could start saving for that new creative project we have. Understanding that this can be a new stepping stone to improving our skills and learning. Our experience has taught us a lot, we now have more than enough understanding to turn things around in a positive way. A few challenges could work in our favour during the next few days, but we will need to take a closer look to notice them. Look beyond with eyes opened to see the opportunity our questions can open up. Events and lessons from the past could help us avoid certain situations, just make sure our ego doesn't get in the way. Pluto is guiding us to see whether we know our true heart's desire. Are we aware that we choose the majority of our desires on the basis of unconscious patterns? Only when we realize what our heart's desire is, that the joy in our heart becomes infinite. With the Moon's trine to Uranus Rx, there could be a few good surprises around the corner and things happening at a faster pace. The energy carries several messages for us and we could be taken on a new journey. It's a great time to put new intentions out there. We are feeling more passionate with this much energy to work on, just think what we can do feeling like this every day. Carry on with our enthusiastic approach, and let it work magic for us. We could be lucky this New Moon as flashes of inspiration guide us towards new opportunities. We will feel connected to people who have a passion for life, and those who laugh a lot and use humor to fill their lives. Let more of that confident nature shine through as there is a wonderful new path to take. Once we sort out in our mind what we want to do, the journey to get there becomes easier. All we have to do is take that first step. Get in touch with the light of our soul. The sooner we become aware of that light, the faster we will progress on our path. Light the path ahead with love. Lift our spirits with play. Define happiness on our own terms.